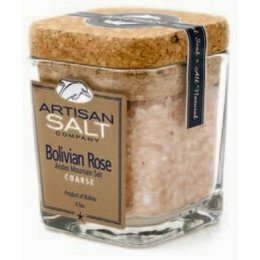 Bolivian Rose salt is hand harvested from the Andes Mountain range in Bolivia. Ancient sea salt deposits were covered with volcanic lava creating this high mineral salt and protecting it from pollution. The light rose & orange color of Bolivian Rose makes it gorgeous when presented in a clear salt shaker or mill.